The Nazi regime of Adolf Hitler tested the limits of Canada's humanity in the lead up to the Second World War and Canada's government failed that test "miserably," Prime Minister Justin Trudeau said today. 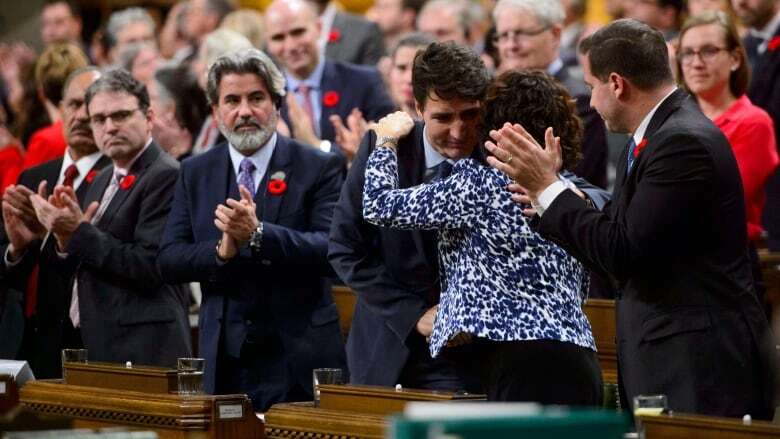 The prime minister made the remarks as part of the apology delivered in the House of Commons for the 1939 decision by the Canadian government to turn away a boatload of German Jews seeking refuge from the Nazis. "In the years leading up to the war, Hitler tested the world's resolve. He noted carefully as country after country proved itself indifferent to the plight of Jewish refugees," Trudeau said. "He watched on as we refused their visas, ignored their letters and denied them entry. With every decree, he challenged the political courage of our leaders and the empathy of those who elected them. "With every pogrom, he tested the bounds of our humanity and the limits of our solidarity ... Adolf Hitler's test was one the Canadian government failed miserably." In 1939, the MS St. Louis left Germany carrying 907 Jewish passengers fleeing persecution by the Nazi regime. The ship was turned away from Cuba and the United States before a group of Canadians tried to convince Prime Minister King's government to let it dock in Halifax. The Canadian government heeded the anti-Semitic sentiment abroad at the time by severely restricting Jewish immigration. From 1933 to 1945, only about 5,000 Jewish refugees were accepted because of Canada's discriminatory 'none is too many' immigration policy. "The story of the St. Louis and its passengers is no isolated incident," Trudeau added. "The Government of Canada was indifferent to the suffering of Jews long before the St. Louis ever set sail for Halifax, and sadly, long after it had returned to Europe." The prime minister went on to say the passengers of the MS St. Louis would have made Canada stronger but "their cries for help were left unanswered, for Canada deemed them unworthy of a home, and undeserving of our help." Trudeau said that Hitler, alone, did not seal the fate of the passengers of the MS St. Louis or the Jewish populations of Europe because for Canada "To harbour such hatred and indifference towards the refugees was to share in the moral responsibility for their deaths." The prime minister said that while decades have passed since the decision to turn away the MS St. Louis, the guilt or shame of rejecting the asylum seekers on that ship remains. "Today, I rise in this House of Commons to issue a long overdue apology to the Jewish refugees Canada turned away," Trudeau said. "We apologize to the 907 German Jews aboard the MS. St-Louis, as well as their families. We also apologize to others who paid the price of our inaction, whom we doomed to the ultimate horror of the death camps. "We used our laws to mask our anti-Semitism, our antipathy, our resentment. We are sorry for the callousness of Canada's response. And we are sorry for not apologizing sooner." Trudeau also apologized for letting anti-Semitism take root in Canada and for the way Canadians Jews were "meant to feel like strangers in their own homes, aliens in their own land. "Your country failed you. And for that, we are sorry." Trudeau went on to note that anti-Semitism continues to be a problem today in Canada. He said 17 per cent of all hate crimes target Canadian Jews — meaning the Jewish community experiences a far higher per-capita rate of hate crimes than any other group in Canada. "Discrimination and violence against Jewish people in Canada and around the world continues at an alarming rate," he said. "Less than two weeks ago, not too far from here, a gunman opened fire on worshippers at the Tree of Life synagogue in Pittsburgh, killing eleven people and wounding six others." The prime minister said that anti-Semitism and other forms of xenophobia have no place in Canada or the world, and that education is the the "most powerful tool against the ignorance and cruelty that fuelled the Holocaust." Trudeau said that in the wake of the Pittsburgh attack, Canadian Jews are understandably feeling vulnerable. He pledged to do more to protect Jewish places of worship. While the apology will not ease the pain for those who lost family members on the MS St. Louis, Trudeau said he hopes it will bring them some sense of peace. "More than 70 years ago, Canada turned its back on you," he said. "But today, Canadians pledge, now and forever — never again." "It is a sign of a healthy society to be able to look at history clearly and see both the light and the dark, to celebrate our achievements but to also mourn our failings," Conservative Leader Andrew Scheer said. "There is no shame as a country in acknowledging shameful acts in our past. The real shame would be in forgetting them." Occasions like these help Canada strike a path for the future, the Conservative leader said, adding that Canadians should continue to stand up to acts of dehumanization that lead to atrocities. "Canada should have offered sanctuary of the passengers of the MS St. Louis. For our failure to do so then we stand with the government today in its apology," Scheer said. "Never again, must 'none be too many.'" "Two hundred and fifty four people who had boarded the MS St. Louis in the hopes of fleeing death ... could have been saved had Canada said, `Yes," `said NDP leader in the House of Commons Guy Caron. "Canada abandoned people who then became victims to Hitler and his hate. "The passengers of the MS St. Louis were fleeing anti-Semitism, unaware that anti-Semitism had crossed the ocean before them. "Intolerance has no place here, yesterday, today and tomorrow." The Bloc Quebecois' Mario Beaulieu also stood in the House to deliver comments in French before Green Party Leader Elizabeth May closed out the apology with her own statement. May said all Canadians bear the "stain of this crime." She noted that we would not understand it as well as we do without the work of historians Irving Abella and Harold Troper, who wrote the book None is Too Many about Canada's anti-Semitic policies during the Second World War and the plight of the MS St. Louis.